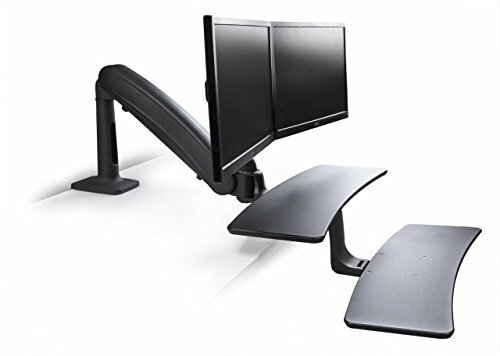 The S2S Dual Comfort-Plus Sit-Stand Workstation incorporates a standardized mounting configuration to enable a quick and easy installation. The rear mounted arm uses gas-assist counter balanced technology that enables users to transition smoothly from a seated to standing working position with grace. The beautifully designed S2S Comfort-Plus Desk Riser also features ergonomic height adjustment performance that meets BIFMA height adjustability requirements. The S2S Comfort-Plus Standing Desk has two large work surfaces to accommodate work materials, and when the workstation is not in use, it can be simply swung to the side to maximize valuable desk space. This new contemporary rear-mount sit-stand workstation has been designed with market leading ergonomics and can easily be installed in minutes. The S2S Comfort-Plus uses a gas assisted counter balanced arm to raise and lower a keyboard and secondary work surface through 22" of smooth acting height adjustment with industry leading stability. To maximize the use of the desk surface the workstation can also be swung to the side when not in use. To provide even more functionality an optional dual monitor kit can securely support 2 x 24" monitors. Beautifully designed, the S2S Comfort-Plus will complement every working environment and provide a sit-stand workstation that allows users to experience health benefits of the 'Sit-Stand Revolution'. Grommet and clamp mount are provided Installation versatility makes the S2S Comfort-Plus compatible with almost any desk or work surface and allows the arm to be positioned in the most suitable location to ensure optimal reach and positioning. If you have any questions about this product by S2S Sit2Stand Standing Desks, contact us by completing and submitting the form below. If you are looking for a specif part number, please include it with your message.